A cabdriver is murdered by a derelict young man for no apparent reason. A young lawyer who has just completed his bar-exam is assigned as his public defender. Before the judge orders his client to be hung, there is not much the attorney can do but talk to the man. 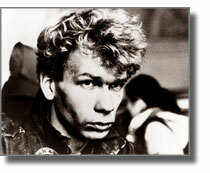 The film, part of Krzysztof Kieslowski’s DECALOGUE-cycle, has the fifth commandment as its subject – presenting the murder and the subsequent hanging with drastic brutality and in agonizing length. A passionate plea against crime as well as the death-sentence that avoids clichés.